Since it was founded 40 years ago, Ardmore Group has grown to become one of the largest privately owned Design and Build main contractors in the UK. Both the owners completed apprenticeships in carpentry and they have been sponsoring staff to study from day one. We caught up with their Employment and Skills Manager, Eillish Kwai, to find out more. When did Ardmore first start sponsoring staff to study, and why? EK: Ardmore has been sponsoring staff to study for the past 40 years. This is still a family-run business and both the owners did apprenticeships themselves, in carpentry. They’ve always had a great understanding and appreciation of the need to train people. It’s been part of the ethos of the company from the start. Graduates who’ve studied full time aren’t always aware of what’s going on in the real world. It stands to reason that if you enter an industry with the right theoretical knowledge and some practical experience you’re going to be in a much better place. When these students finish their courses, they already understand our business. They know how to work as part of a team, and they’re more confident too – they’ve seen how their skills and knowledge can make a real difference to significant, high value projects. Typically, how many staff are being sponsored to study at any one time? EK: There are around 20 employees currently on undergraduate and postgraduate programmes. We also have around 50 apprentices at levels 2 and 3. But we are in the process of creating three new roles in surveying, design and project management which will also form part of the apprenticeship scheme. That will mean gaining a further 40 apprentices by September. We also have one young man on an HND course, who started out as an apprentice. Give us an overview of the types of courses they are studying. EK: On our graduate programmes, we have quantity surveyors, design managers and assistant project managers. To date around nine students have studied or are studying at LSBU, while others are elsewhere. The postgraduate students in particular often have a strong preference as to where they want to study. Our apprenticeships cover all the trades, including plumbing, electrical, carpentry, bricklaying and painting and decorating, although the majority are in plumbing, electrical and carpentry. Our apprentices are studying at a number of different colleges – Lewisham Southwark College, Barking and Dagenham College and Ealing, Hammersmith & West London College. How do you identify the right course or institution? EK: We look carefully at the credentials of all the institutions we work with. Of course, we’re looking for a curriculum that covers the areas we need, but we also look at things like completion rates and how the tutors work with and support their students. What kind of support do you offer for students in the workplace? EK: For our degree level students, we run regular seminars. These will be delivered by senior members of staff and the aim is to ensure that the students are staying up to date with the latest developments in construction. So for example our design director might deliver a session on the latest changes to planning law. That kind of practical knowledge really complements the theoretical knowledge they’re gaining at university. Each student is also assigned a mentor from among our existing staff, who they will work with very closely on a day-to-day basis. Students are also given the opportunity to get involved in the training we offer our staff. This past year, for example, we’ve provided a lot of development opportunities focusing on leadership and management. Students have been able to take advantage of that. How do you monitor student performance? EK: Each student has a monthly meeting with the HR training adviser. We’re making a significant investment in them, and we want to know that it’s worthwhile. Having said that, we do also rely on our students to tell us if they’re not getting the support they need. They should be mature enough to take responsibility for their learning and their future career. How far has sponsored study met your expectations? EK: Certainly with the degree level courses, I would say sponsored study meets our expectations 100%. There is a shortage throughout the industry of good quantity surveyors and design managers. For us at Ardmore, sponsored study has proved to be a really effective way of developing the kind of high calibre employees our business needs. They have a connection with the company, and we find that makes them more likely to stay with us long term. Do you think offering sponsored study enhances recruitment? EK: I think it’s a very attractive option. They’re able to earn a good salary while having their tuition fees paid and getting a degree at the same time. That’s a huge benefit to them. How does sponsoring students enhance your company’s productivity? EK: We know them, and they know us. There’s a level of commitment there, I think. They recognise what we’ve done for them, and they are prepared to work very hard for us in return. Generally I would say our retention rates for sponsored students are pretty high. Talk us through your future plans for staff skills development. EK: We’re very interested in looking at Higher and Degree Apprenticeships as a way to further help us address skills shortages. Construction is a very fast-growing area and we need to know that we have enough skilled people available to help us meet demand over the next 15 years or so. How is LSBU supporting you in these plans? EK: As far I’m aware, LSBU is the only university going down the Higher and Degree Apprenticeships route. We’re talking, and looking at how we can work together, although it’s still early days. Provisionally, we’re looking at offering opportunities in six different areas. Where we really need support from LSBU is in helping us identify and attract strong, motivated candidates. 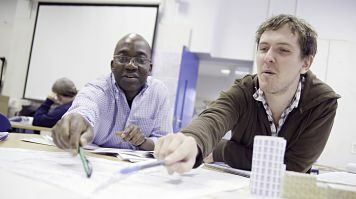 London South Bank University (LSBU) delivers high quality professional and technical sponsored education to over 6,500 students funded by nearly 1,000 employer partners. Find out more about our Built Environment and Engineering courses.